It's that time of year again. Time for LSU football. First game this weekend against Oregon in Cowboy Stadium! I'm so excited for some football! So on that note it's an LSU theme Pinterest week! How cute is this fleur-de-lis? Maybe with a grey background, purple and gold buttons and a gold frame? Love this wreath! I haven't really been a "wreath" person because but Pinterest is changing my mind on that! Cute! Wonder where I can buy a tile or two to do this with? I have purple vinyl! Seriously how cute is this? Not LSU but still football - I love this because it reminds me of Beau's 2 month baby picture only the babe here is much smaller! 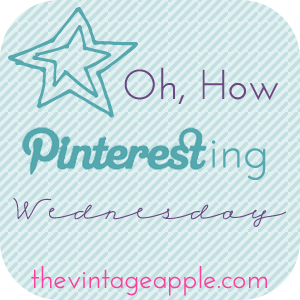 If you want to link up your own pins head over to The Vintage Apple! That baby with the tiger - adorable! !